This is Erik Wøllo's 11th. album and and with this album he again offers a wide selection of exciting electronic musical moods. Music that is both dark and light, near and far away, all the time with a high sensibility on suggestive minimalist qualities, that leave much open to the imagination. It contains 15 pieces of music that range from slow drifting snowy landscapes, to more intense grooves with tastefully use of melodic patterns and sequenzes. A highly personal musical world of rich, vibrant textures and rhythmic pulses, gently melodic journeys through soundscapes of synthesizer sound. Erik Wøllo has been working as a full time composer in Norway since 1980, and on this album there are also a few tracks he made for TV documentary films from polar expeditions. Some tracks were also used as background music for the Winter Olympic Games in Salt Lake City, 2002. Electronic, ambient "polar" music! An imaginary expedition to unknown, yet undiscovered landscapes! 2003. Press information Recently, many excellent electronic music-CD’s are released but every now and then one comes out that really does something to you and leaves you with a great feeling. Music that grabs you by the throat, music to hear over and over again. 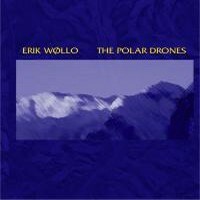 Erik Wøllo’s "The Polar Drones" is one of those albums. In his long career, this Norwegian ambient-artist has created many, well respected albums and gave fine concerts. "The Polar Drones" contains very beautifully constructed pieces of music that form a mixture between slowly drifting images of icy landscapes, intriguing rhythms and simple but innovative sequences. "Expedition" is a perfect example: it reflects the intelligent musical reflections of Erik’s fellow-countryman Geir Jenssen (Biosphere) but has a more lively approach to it through the use of rhythms. Brilliant sequences are put into pieces like "Soft Machine", "Pulsar" and "The Return of the Sun". Sometimes, the music gets darker as in "Polar Drone 2", "Eyes Of The Horizon" and "Farewell" and the percussion in "The Struggle" reminds of Steve Roach. The highlight of the album is "Glacier Blue" with a great atmosphere, great rhythms and great use of a female vocal. If there exists something like "Polar music", "The Polar Drones" is it! 2003. Paul Rijkens oh this is great! 2003. Solarsen / United States Of America Small things are perfectly formed. This could be said of music by Erik Wøllo. The 15 tracks on The Polar Drones (69'25"), his 11th album, are minute yet impeccably executed in exacting flair. In the span of two to five minutes each of these miniatures offers a broad range in mood and music - from brisk grooves and penetrating rhythms to crystalline dreamscapes and delicate starlit melodies - The Polar Drones easily moves thematically through gleaming glacial panoramas on out into the Arctic winter's long dark night. Most of the tracks here exist as individual statements, but some have been strung together through interesting cross fades and transitions. "Pulsar" (4'50") opens cold with cascading interlocked sequencer tones beneath a ribbon of luminous swirling effects. "The Return of the Sun" (7'29") begins in much the same way, but quickly evolves into a weighty tour across a frozen landscape inhabited by icy piano-like tones and undulating bass lines. "Distant Sun Rays" (2'51") moves slowly as deep churning drones slide beneath Wøllo's breathing guitar and synth pads. Equally beautiful and arresting is the concluding track "Farewell" (4'08") - euphonic in its drift beneath the circling star trails and shining auroras of the polar regions. Other tracks hint at Drum 'n Bass, Trance and World Music influences - all rising out of Wøllo's Contemporary Instrumental stylings. A real tonic in the themes, Wøllo's music does not lose its power to familiarity. There is a majestic quality to The Polar Drones - a harmony within its spirituality, development and design. Whether he is describing the bareness of a vast tundral landscape or the complexity of an individual snowflake - Erik Wøllo offers incredible insight into the world through the infinite perspectives of music. 2003. Chuck van Zyl / Star's End Erik Wøllo is a musician who makes in electronic new-age. Here is his 11th album Polar Drones. Fifteen short pieces make this cd, and I must admit that I was agreeably surprised. It doesn't have hollow moments, or boring moments. The tracks are well structured and we even have light rhythm, here and there. This opus contains pure jewels, I think in particular of Expedition, Zima, and the very beautiful Glowing. In short, a very beautiful CD. Not pretentious, it’s listenable extremely well. A pleasant surprise which worth amply the turning. 2003. Sylvain Lupari / Canada We find ourselves before one of the most Space albums by Erik Wollo. Working on the most electronic slopes of his personal style, Wollo offers us a collection of magnificent soundscapes. The polar inspiration of the album, so obvious in the title, appears to be perceived in many passages. Listening to the music, it happens to be easy to imagine oneself in the midst of the vast bleakness of the polar regions of our world. Incommensurable extensions of ice fading into the horizon. Icebergs majestically floating on the freezing waters as if they were titans. Ghostly dusks. The immensity of wild nature, still untamed by the human being, exhibiting its beauty as well as its aggressively at the same time. 2003. Edgar Kogler One of Norway's most famous and experienced electronic composers has released a CD with tracks that has previously been used for at least three different projects (not albums), including TV documentaries about polar expeditions, recorded over a period of six years. This makes the album pointing in different directions with less coherence that it could have had. Is it melodic? Is it trancey? Is it ambient? While variation is a good thing, there must be coherence. Polar Drones works best when it focuses on pure ambient soundscapes, or goes intro classic EM / ambient techno territory. Tracks like Pulsar, The Return of the Sun, and Soft Machine belongs to the latter category, and has great up-beat atmospheric beats that I can clearly "see" are related to cold winds, freezing temperatures and ice. Zima is an interesting exercise in tribal rhythms and electronic soundscapes. A bit out of place, but it works. Then you have tracks like The Struggle and Expedition, which sounds like a bunch of good ideas, but not developed enough. Glowing is a more melodic song, but too cute for my taste; it doesn't entirely fit the serious side that this album has. Many of the ambient exercises are very good; Polar Drone 1 & 2, Map of the Mind, Eyes on the Horizon, Farewell. They all have movement, fluctuating textures and spicy effects. But the album jumps between slow ambience and ambient techno-ish tracks, which is a bit disturbing for me. I think Polar Drones would have benefited from leaving a couple of tracks out and changed the order of the remaining tracks. As it is now, it puts you in one mood but pulls you out with the next song. 2003. Glenn Folkvord You’ll have to excuse the deliberate pun, but Erik Wøllo’s album, The Polar Drones, is the perfect album to "chill out" with. This is a superb collection of fifteen tracks that feature all manner of electronic music that never revs up too much nor lays down too low, and how better to describe chill-out music? Of course, I consider myself a huge fan of this Norwegian artist, appreciating all aspects of his talent, from his acoustic and electric guitar playing (such as on his release Guitar Nova) as well as his electronic keyboard skills (on releases like Transit and Emotional Landscapes). The Polar Drones finds him camped almost exclusively in the latter arena, with many songs displaying his talents on layering various synthesizers and dropping in assorted electronic and acoustic percussion to yield exquisite downtempo music that covers everything from ambient to EM to chill-out to electronica. Opening with the eerily beautiful short ambient piece "The Barren Land Theme" (with swirling washes and twinkling synth tones and Wøllo’s signature echoed piano notes), the CD’s first foray into beats is on the next number, "Expedition". As the track begins, there are icicle-like shimmering textures that fade into bump-a-bump slow tempo bass beats, buoyed by mellow underlying synths and an undulating wash of keyboards. "Zima" (one of three tracks that are longer than six minutes), begins in a forbidding vein, with echoed gong-like reverberations and strange noise effects. A steady clock-ish beat emerges along with watery tones, before Wøllo starts blending in an array of ethnic percussion rhythms amid whirly-gigging electronics. He then folds in more lush undercurrents of synthesizers that pulse with life beneath the now snappy more electronica-like beats. He wraps it all up with delicate guitar work laced throughout all the beats and tones. Some of the songs on The Polar Drones are musically evocative of a frozen wasteland, yet one that is filled with majesty and beauty. One such track is the short title piece (one of two selections titled The Polar Drones, this one being "The Polar Drones 1"). Layers of keyboards and synths float along effortlessly with an air of icy beauty and one can almost picture an expanse of blue-white glaciers stretching out to the horizon. Then there are completely different songs, such as the next one, "Soft Machine" a track that marries minor key synths with a rapid chugging beat and underlying bass notes, having an almost railroad-like cadence to them. The undercurrent of gentle warm drones provides a soothing backdrop to the percolating rhythms. Another overt electronic piece is the aptly-titled "Pulsar" which, of course, has a decidedly spacemusic-ish feel to it and features assorted electronic beats and swooshing retro-ish keyboards. "Map of the Mind" follows, and here the emphasis is on muted electronic textures and a Patrick O’Hearn-like mournful bass lead line. Two of the last four songs are seven-plus minutes in length, "The Return of the Sun", and "Glacier Blue". "The Return of the Sun" begins in a neo-Germanic vein, all aglow with sequenced synth notes and gentle whistling tones, before coming alive with more dramatic rhythms and the emergence of electric guitar, bass beats, and Wøllo’s recognizable echoed piano. As the track builds up steam, the artist adds yet more textures and elements to the song, yet it never really gets too "hot" because this, after all, The POLAR Drones! The album ends with a perfect closing track, the softly beautiful synthesizer song, "Farewell", which concludes the CD on a haunting reflective note, filled with a touch of regret. Of interest is that Wøllo composed the first seven tracks as a promotional CD for a company and some of the other songs were used as soundtrack selections for a TV documentary on polar expeditions and also as background music for the 2002 Winter Olympics. Whoever selected these pieces as musical accompaniment to those events should be commended on his/her taste, because The Polar Drones is visually evocative music of the highest degree. While you could play this in the background and enjoy it just fine that way, I think that you, like me, would consistently find your attention being grabbed by the plaintive melodies and catchy rhythms. Before you know it, you’d be dreaming of ice fields, towering snow-capped mountains and night skies aglow with the humbling beauty of the aurora borealis. The Polar Drones earns my highest recommendation and further solidifies my belief that Erik Wøllo is one of the more innovative and under-rated artists in the EM genre. 2004. Bill Binkelman / Wind & Wire This CD from 2003 features 69 minutes of energized ambience. Norwegian Erik Wollo combines the atmospheric qualities of Geir Jenssen (aka Biosphere) and American ambient maestro Steve Roach with his own individualistic arctic spin, generating soundscapes that are lavish but hardly understated. Icy textures float like shimmering clouds overhead, while crystalline keyboards enunciate delicate harmonics that convey a pleasant frigidity. These electronics do more than simply evoke arctic landscapes, they convey strong tactile impressions that transform this music into a full sensory experience. Exalted percussion provides congenial rhythms for this sparkling electronic tapestry. Nimble tempos inject an energetic flair to the even-tempered flow, attributing the ambience with a compelling verve. Despite their languid nature, Wollo's compositions are passionate and gripping. He creates a dreamy serenity that is laced with a sense of tension infused with a softly seething power that remains unintrusive, but is impossible to ignore. His melodies are often considerably more complex than drifting atmospheric structures, peppered with invigorating passages that uplift and open one's mental eyes to intangible beauty. Some of this music was originally made for TV documentary films for polar expeditions, while other tracks were used as background music for the Winter Olympic Games in Salt Lake City in 2002.